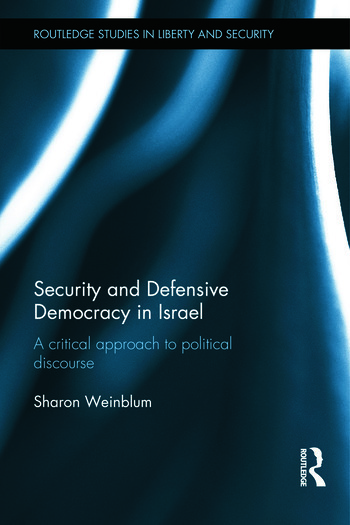 This book scrutinises how political actors in the Israeli parliament (the Knesset) have articulated the security-democracy nexus in their discourses. Security crises expose political leaders to an uncomfortable dilemma: guaranteeing the safety of citizens while at the same time preserving democratic principles, basic rights and liberties. In this respect, Israel represents an archetypical case. Defining itself as a democracy, the state of Israel has been in quasi-constant conflict with its neighbouring countries while facing terror attacks repeatedly. This situation has resulted in the upholding of the state of emergency since the establishment of the state in 1948 and in the enactment of security measures that are often in conflict with democratic values. The tension between security and democracy is not a new question: it has been at the centre of political thought from Rousseau and Locke to Lasswell and Dahl and stood at the core of political debates after 9/11 and the 2005 terror attacks in London. Many studies have questioned how political actors manage this tension or how they could – properly – balance security and democracy. Yet, in spite of the abundant literature on the issue, the manner in which political actors conceptualise and frame this tension has been rarely explored. Even less has been said on the effects of this conceptualisation on the democratic regime. Drawing on discourse theory and on an innovative narrative analysis, the book examines 40 debates held in the Knesset on security-oriented laws enacted in two different contexts: the period of relative calm preceding the first Palestinian intifada (1987) and the period following the eruption of the second intifada (2000). More specifically, three types of laws and discussions are examined: laws establishing a relation between freedom of expression and security; laws linking the category of 'the enemy' to democracy; and finally those connecting the right to family unification and residence of Palestinians with terrorism. Through a comparative analysis of the political actors’ discourses in 1985 and between 2000 and 2011, the study demonstrates that two main narratives have constantly competed: on the one hand a marginal narrative anchored in basic rights and on the other a defensive democracy narrative, which has become dominant. The latter has legitimised the restriction of freedom of expression, freedom to participate in elections, freedom of movement or the right to citizenship. The book shows how the increasing dominance of the defensive democracy narrative has had a fundamental impact in reshaping the polity and the identity of Israel’s democratic regime. The analysis ultimately opens the possibility to rethink the conventional approach of the security-democracy dilemma and to reflect on processes in other states, such as the United Kingdom or the United States during different security crises. This book will be of much interest to students of critical security studies, Israeli politics, democracy studies, political theory and IR in general. Sharon Weinblum is a Postdoctoral Fellow at University of Oxford and has a PhD in Social and Politial Sciences from the Université libre de Bruxelles, Belgium.